All pillows are not equal. Some are cooler than others. If you sleep hot, you should consider buying a pillow that helps keep that body temperature. Otherwise, you might be continuously flipping the pillow through the night to find a cool spot for your head. Cooling pillows come in all kinds of materials, shapes, and designs. Check out some of the info below to see if they’re right for you. PCM Beads that absorb heat. The following 4 pillow types are more airy and cooler than others. This pillow type has a layer of water below a foam or polyester or down layer. The water layer is protected by a therma-shield, which prevents heat from the body reaching the water player. Because of this, these pillows become less warm than others. Some water pillows also include a gel pouch, which further improves the ability of the pillow to stay cool. Besides staying comfortably cool, water pillows also offer great support and are a good option for someone with neck pain. One drawback, however, is that they can make a little noise each time you move, causing disturbance to those who sleep light. Usually the noise occurs when some air is still present in the water pouch after it has been filled. Removing the air will take care of this issue. Developed by NASA in late 60s, memory foam became a popular pillow filling material some thirty years later owing to its unique ability to perfectly contour to the sleeper’s body. Supportive as memory foam is, it has one big shortcoming: they retain heat transferred from the sleeper’s body. That’s why foam gel pillows are a much better option. They provide all the benefits of memory plus minus their biggest shortcoming. The gel particles keep the pillow comfortably cool, allowing you to lull into a sound sleep. However, no pillow material is perfect, and the memory foam gel is no exception. This type of pillow is usually quite firm. If you are accustomed to soft pillows, you might find adjusting to it difficult. Another disadvantage is that they have a strong smell when new. These pillows contain a mix of feather and down feather and are airy, soft, comfortable. 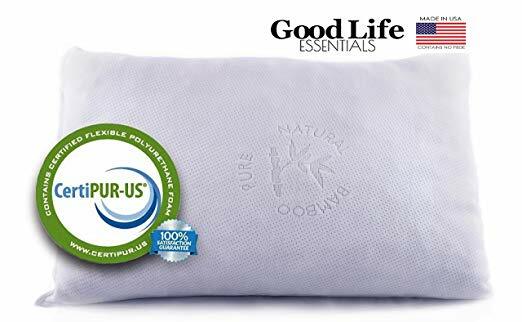 Apart from being breathable, these pillows provide great support to the neck and the head and have a long life with proper care and cleaning. One of the negatives of the down pillow is that sometimes the quills can poke out through the surface, especially if the stitching is of not the highest quality. They are also not washable, which, however, is not much of a problem if you store them in a breathable bag when not in use. Hundred percent eco-friendly material, increased air flow, and a long life (up to 10 years) are some of the biggest advantages of the buckwheat pillow. This pillow retains less heat than down, foam, and fiber fill pillows. Buckwheat pillows also offer good head support. You can’t wash these pillows. Exposure to water ruins them completely, so you have to be careful about this. Another drawback is that hulls make a little noise when you move. Buyers Beware: Many manufactures promote their pillows as “cool” pillows when in reality their pillows do not remain cold, at least not for any considerable amount of time. Most of these “cold” pillows are not cold as such, but rather they don’t get as warm as other pillows. Normal cooling pillows will not prove of much help if you are experiencing night sweats. There are special night sweat cooling pillows and cooling mats, some requiring refrigeration for some time before use and some not, and you must consider these. A cooling pillow alone can’t keep you cool when the mercury is touching hundred and there is no air conditioning. In combination with any of the following, it, however, might help you enjoy a good night’s sleep. Create a DIY air conditioner. A little creativity is all that is required for this, besides a standing or desk fan and ice. There are many different ways of creating a DIY air conditioner, the simplest being keeping a shallow bowl filled with ice in front of a fan. As the ice melts when the fan blows, a fine mist of cool water is created, which, in turn, keeps you cool. You can put this into application when there is a breeze outside and a window in the room. Put one box fan at the window and one opposite it to draw cooler air in and push out the hot air out. Put the sheets in the fridge prior to sleep. All you’ve to do is put the sheets inside a plastic bag, seal it thoroughly, and toss it into the refrigerator or fridge for a few minutes. Remember to check the seal twice. It must be tightly shut; otherwise, moisture will make the sheet wet and unusable when you take it out. This method gives you momentary relief, enough to help you fall asleep but not enough to keep you cool for a long time. Temporary it may be, but it is relief nonetheless (and on hot, sultry night with no AC, any help is welcome). Many comfortable pillows tend to become warm as the hours of the night tick away, but this one doesn’t—and that’s its main advantage. This pillow remains comfortably cool (but it is not cold, mind you) all night, thanks to PCM beads. 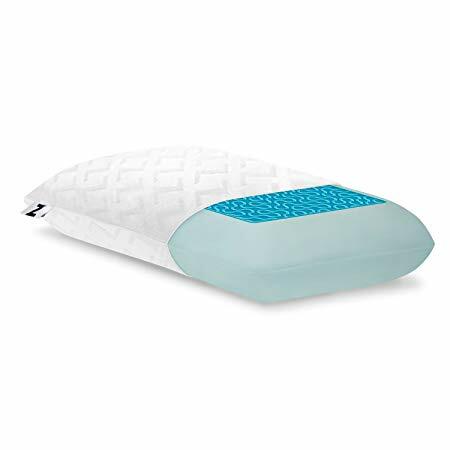 It is a good option for hot sleepers; however, those being troubled by night sweats might need something cooler, perhaps a special night sweat cool pillow. The Sleep Better Pillow works well for both side and back sleepers. Its firmness is just right, not too much or too less. The zip-off pillow cover is 100% cotton, hypoallergenic, and washable, so there’s no concern here. As the pillow is made in the USA, buyers who prefer products made in the country have another reason to seriously consider this pillow form Sleep Better. My only gripe is the smell. All memory foam pillows smell when new, but this one smells more strongly than most. You would want to air it out for a few days at least before putting it on your sleeping mattress. This pillow uses shredded memory foam, which provides all the comfort of memory foam but does not let heat buildup like them. A good choice for those who like the firmness and support memory foam provides but not its getting warm quickly. The makers have opted for bamboo cover (50% bamboo and 50% polyester), which further enhances air circulation. The Shredded Memory Foam Pillow is made of foam approved by CertiPur-US. Foams carrying this certification are made with safe materials. If you are conscious about these things, you might want to consider this pillow. And, yes, it is hypoallergenic and dust mite resistant and so suitable for asthmatics and allergy suffers. Cleaning it is also not a problem. You can wash it in a washing machine any time you feel the need. Another impressive feature, not present in many memory foam pillows, is a 5-year warranty against loss of shape. The plastic smell when you unwrap it is rather quite strong. A few days airing out is a must, unless you’ve a diminished sense of smell, which here will prove a blessing for a change. You won’t feel a hot spot under your head when you lie on this pillow because it dissipates heat quickly. However, expecting it to stay really cool will be a mistake, because it doesn’t. It just doesn’t get warm—and that’s no small thing (especially when most pillows do). The pillow has medium firmness. If you are used to foam pillows, you might enjoy sleeping on it. Down pillow sleepers may take some time to get used to the extra firmness, however. It has a zip-off pillow cover, which is nice because removing and putting back on such covers is so easy. The other good thing is that the pillow fits into any standard pillow case. Asthma and allergy sufferers can use it without a worry as it is hypoallergenic. With a “made in the USA” tag on it, the Side Sleeper pillow might be something that buyers interested only in pillows made locally would want to consider. All in all it is a decent pillow. It is comfortable and doesn’t let heat buildup like many others. The product description reads “high loft”, and it indeed is. Thanks to its high loft, it helps maintain the neck, head, and spine alignment. However, most users will take a few nights, as did I, to get used to it (Some, however, may still not get adjusted to its extra thickness). Side sleepers, because they need a thicker pillow, will get adjusted to it faster than back sleepers. The best part about this pillow is its gel, which keeps the pillow comfortably cool. You will not feel any hot spot while lying over it. The cover is bamboo velour, which is comfortable, soft to touch and washable. There’s a 5-year warranty against any manufacturing defects on it, which is also nice. While the pillow does smell when you take it out, the smell is not as bad as in case of some other memory foam pillows. However, this pillow is quite heavy (you wouldn’t want to take it from one room to another often). This reversible pillow is medium firm on one side and medium soft on another, making it a good choice for different types of sleepers, including those who sometimes like a firm pillow and sometimes soft. If you are a hot sleeper, you might want to use the gel side, because it is definitely cooler than the memory foam side. The gel material does a good job in dissipating heat passing on to the pillow from your body, but it doesn’t turn the pillow into a cold pillow. It rather prevents heat build-up, ensuring the pillow doesn’t get warm as the night progresses. The pillow is removable and washable. Another good thing is the 3-year warranty that it carries. It shows that the manufacturer backs its product. Expect a slight smell when you unwrap it. After a few days, however, the smell fades away enough to not bother you much.